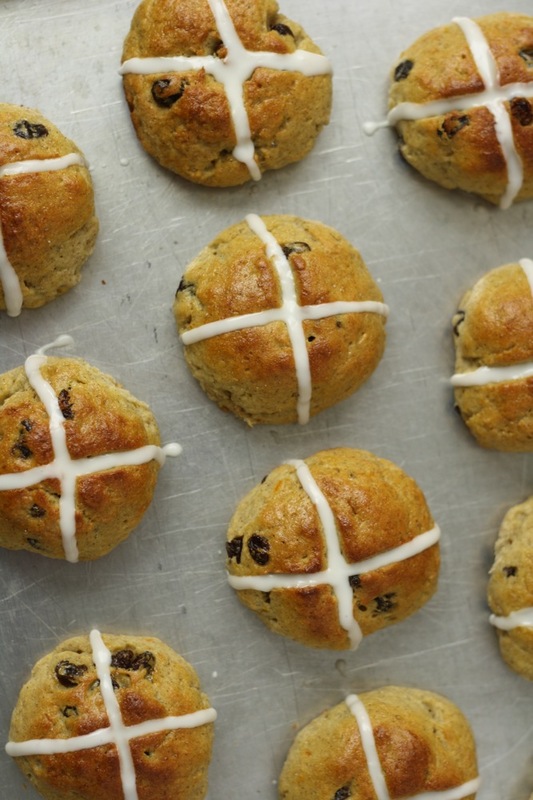 Easter is fast approaching, which means it’s time for hot cross buns! 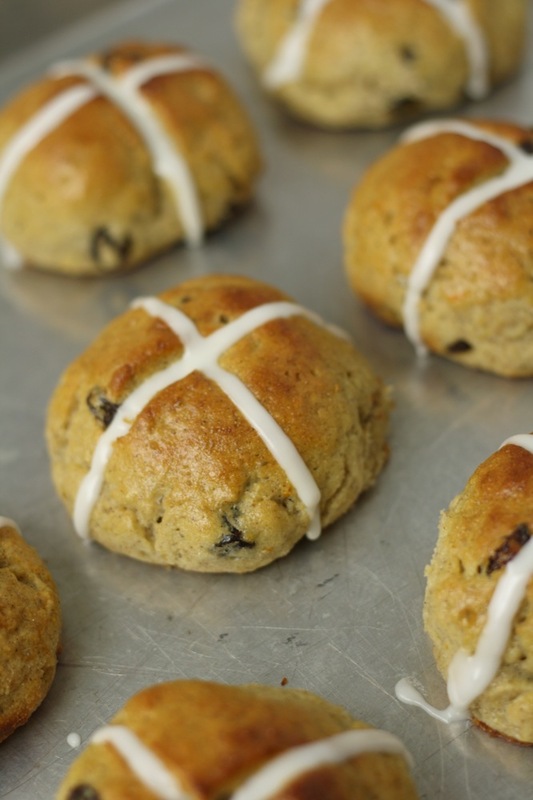 These sweet, spiced buns are traditionally eaten on Good Friday in advance of Easter Sunday. Currants or raisins are a popular addition. Here, we’ve opted for raisins, plus a blend of orange and lemon zest, spices (including a touch of ground ginger), and honey. The dough itself isn’t especially sweet in our version, but the icing adds enough touch of sweetness to make the end result wonderfully balanced. It was fun to make these buns. Our family’s Easter traditions include a Polish sweet bread we call mock cake, usually a baked ham, and a few other particulars. But despite the fact that hot cross buns date back centuries, it wasn’t until you all prompted us—via Facebook—to come up with a gluten-free version of this beloved classic. 1. In a large bowl, combine the milk, 1 tsp honey, and the yeast and let set for 5 minutes until the yeast is activated. 2. In a separate bowl, whisk together the flour, allspice, cinnamon, salt, xanthan gum, and ginger. Set aside. 3. In another small bowl, whisk together the melted butter, eggs, raisins, remaining 1/2 cup honey, and orange and lemon zest. 4. Add the wet ingredients to the yeast mixture, stirring to combine. Then add the flour mixture and combine to form a wet dough. 5. Grease a cookie sheet or baking pan. 6. In a small ramekin or similar, pour 2 tbsp or so of olive oil. Lightly coat the fingers and palms of your hands, and pinch off a large-ping-pong-sized ball of dough, and roll between your hands to form a smooth ball. 7. Repeat until you have 20, placing them evenly spaced apart on the sheet. Use a greased knife to cut a cross shape into the surface of each dough ball. 8. Cover and let rise in a warm location for at least 1 hour. 9. Preheat the oven to 400 deg F.
10. Whisk together the egg and milk to form the glaze. Brush the buns. 12. Let cool completely on a wire rack. 13. Mix together the powdered sugar and milk to form the icing. Add extra powdered sugar to make it thicker. Use a pastry bag, zip top bag with corner snipped, or similar to pipe the icing into a cross shape. I notice that you aren’t using a stand mixer for these buns. 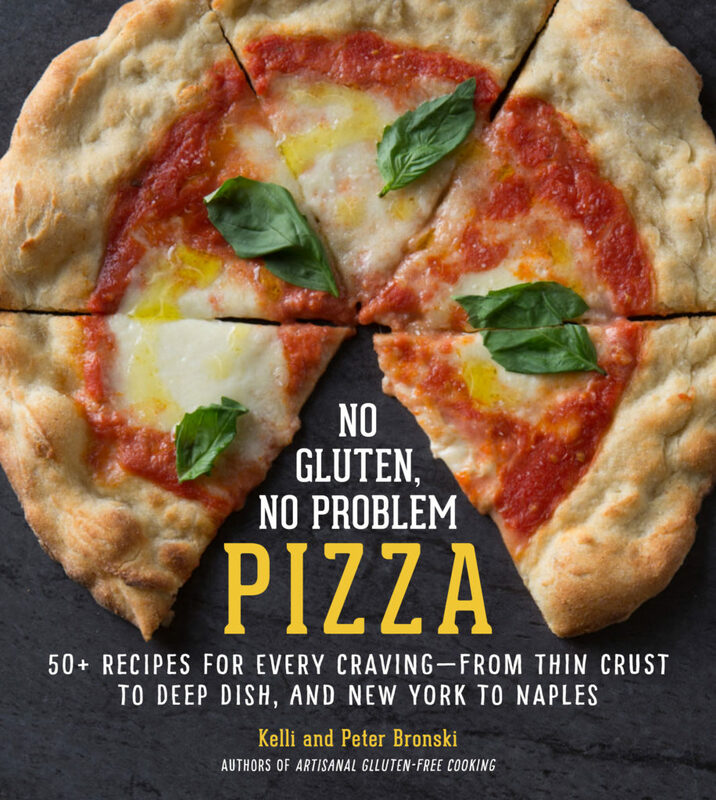 In your cookbook, several of your bread recipes do use one, and I not only don’t have a stand mixer, I don’t have room for one. Can I make these recipes – the bagels, especially, since they look so good – by hand instead? Definitely! These were made by hand without a mixer. The bagels could be made by hand as well. We prefer to make sweet doughs by hand (mock cake, cinnamon rolls, hot cross buns) because they are wet doughs and are less sticky when mixed by hand, but all of the recipes can be made without a mixer. Thank you, Kelli. I’m looking forward to bagels on Easter morning, now, and mock cake, as well: the mother of one of my high school friends used to make this every Christmas, and would always save me a large piece. I’m looking forward to enjoying it again. Great! I will be making our mock cake tomorrow as the girls and I will be traveling for Easter. We will be making the poppyseed filling from scratch that we will post, hopefully on Friday. These Hot Cross Buns look delicious! I needed a new ecipe to take to my sister-in-law’s for Easter. Thank you! This hot cross bun recipe looks great. I am actually dairy free and wondered whether you could possibly suggest what I could substitute to make this recipe dairy free? I made your hot cross buns today and they taste delicious. The only issue is that they are slightly dry and I don’t know how to fix this. I read somewhere that you must remove sugar and fat to moisten yeasted doughs but I’m not sure. I would really value your advice.. Please note that I used arrowroot starch instead of cornstarch (as per your substitutions) and 100% potato starch (ie no potato flour) and used olive oil and almond milk to make them dairy free. Thank you! Thanks a million for this recipe. I adapted slightly to accommodate other health considerations but the proof was definitely in the pudding as my wife and three kids wolfed down the buns at the rate of one per minute. I love the icing sugar and soy milk mix. It’s just like a crispy creame donut. Anonymous – Sorry for the delay in getting back to you! To make this dairy free I would substitute almond milk for the cow milk and use coconut oil or spectrum shortening for the butter. Graingie – thank you for your note and I am sorry they came out a little dry. I would try decreasing the flour to 3 1/2 cups, and add a little more if the dough is too sticky to handle. 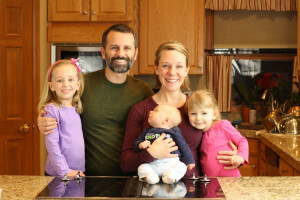 Tingletingle – We are so glad you and your family enjoyed the Hot Cross Buns! Thank you for letting us know. I noticed there is already zanthan gum in your flour blend, then is listed again in this recipe as a separate item. Is this correct? (approx 1 and 3/4 teaspoon for the recipe? This seems like a lot). Thanks! I have the same question about the added Zanthan gum. Thanks!